It's a long weekend coming up and traditionally this particular long weekend is when a majority of us Canadians are in the garden centres dreaming and planning our summer gardens (and patios); so when I came across the hashtag #gardenspam on instagram recently, I was instantly pulled in. So many lovely ideas to be inspired by. Here's a few that caught our eyes. (Above) Love these hues from @_finntage. 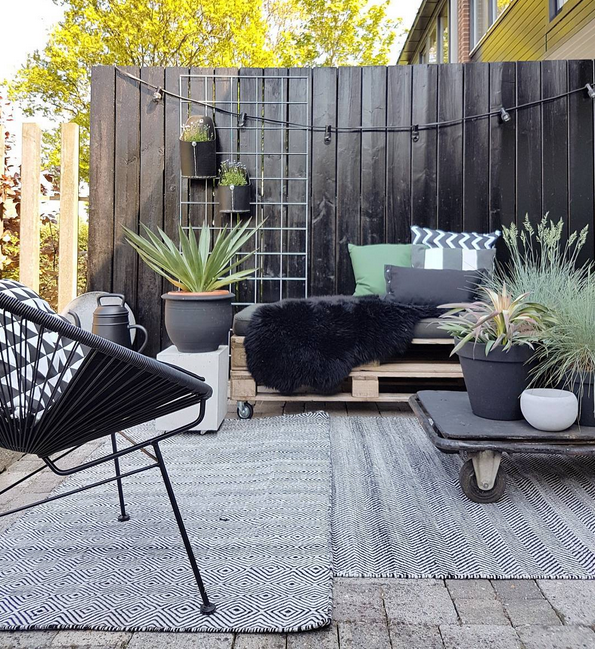 Love these posts as a little yard divider by @marlouvdooren. A cozy sofa for curling up and reading a book. By @s.o.n.i.a.d. Keep warm on cooler spring nights with some soft sheepskin. From @nancyhoogewerf. Love the colour of that door amongst all the herbs. From @rosemalton. Think outside the box and plant some succulents in a strawberry planter. By @ryetanphotos. A corner of a deck gets ready for summer. Via @home_by_lin. A romantic spot at the back. By @thislife_thesemoments. Take cue from a conservatory and build a green wall. Photo @luciaalexander. Love everything about this garden. By @markraydavis. Nothing like an English garden shed. Photo @the_oxfordshire_farm_cottage. A nice spot to hang your hat and soak in some Vitamin D. Photo @s.o.n.i.a.d. A great idea to bring in the light on a summer night. Via @s.o.n.i.a.d. Or go home! Another beauty from @@s.o.n.i.a.d. Love this edible garden set up from @ikplukgeluk. Pops of yellow brighten this cozy nook. Photo @inge.bruins. A tropical path along the veranda. By @melinda_boundy_designs. 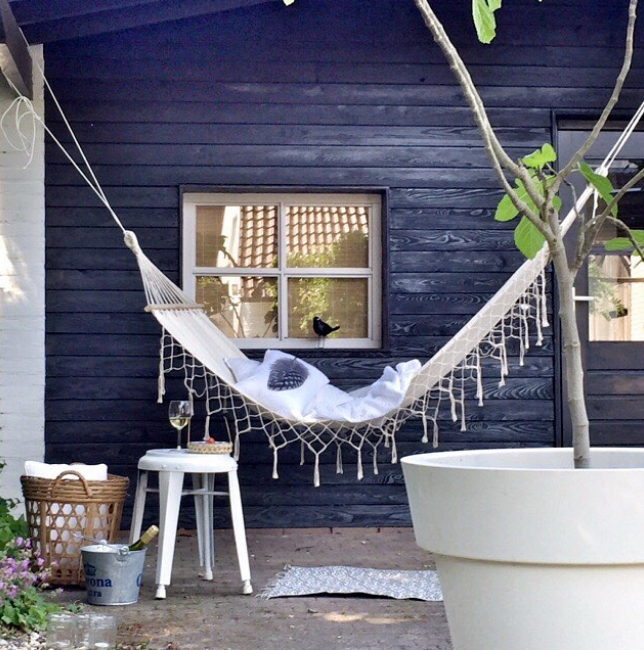 A white hammock against a charred wood building (Shou-Sugi-Ban) = love. From @dewemelaer. A cool pond by the deck filled with koi. By @jaimyinterieur.